Fuzzball & Scuzzball - ROUND 1! Comic 252 - ROUND 1! 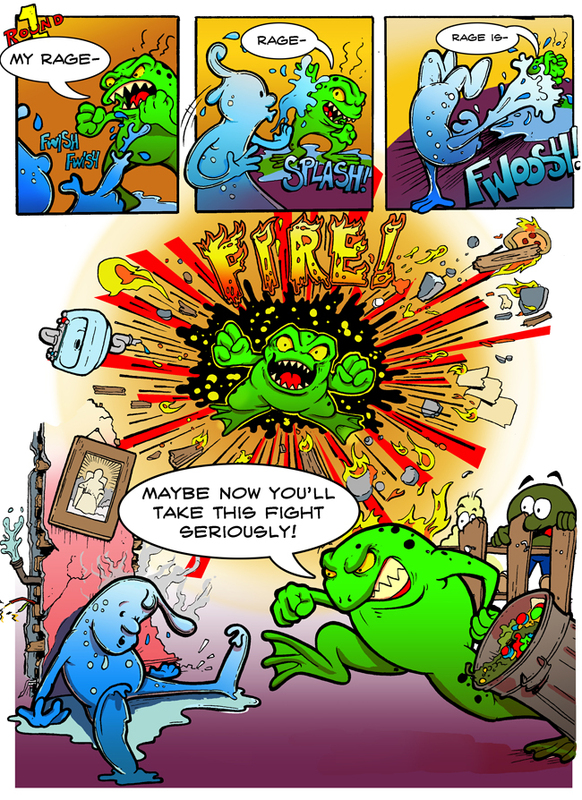 Last time we saw Drip-Drop Man facing off against Hate Frog, and now the battle has begun! What's even more exciting, though, is that today's installment was written and drawn by my friend Jeffrey Johnson. Jeffrey is the talented artist behind Life With Girls, and Penny Loves Dinosaurs, as well as a wide variety of beautiful illustrations. I am extremely grateful to Jeffrey for taking time out of his busy schedule to do this, and I love how it turned out. Be sure to check out Jeffrey's site and order stuff from him. Seriously, he has a lot of stuff you can choose from--my wife ordered a set of little peg people from him, as a Christmas present for our son, and we were all very very happy with how they turned out. TOMORROW: The battle continues, with another very special guest artist!